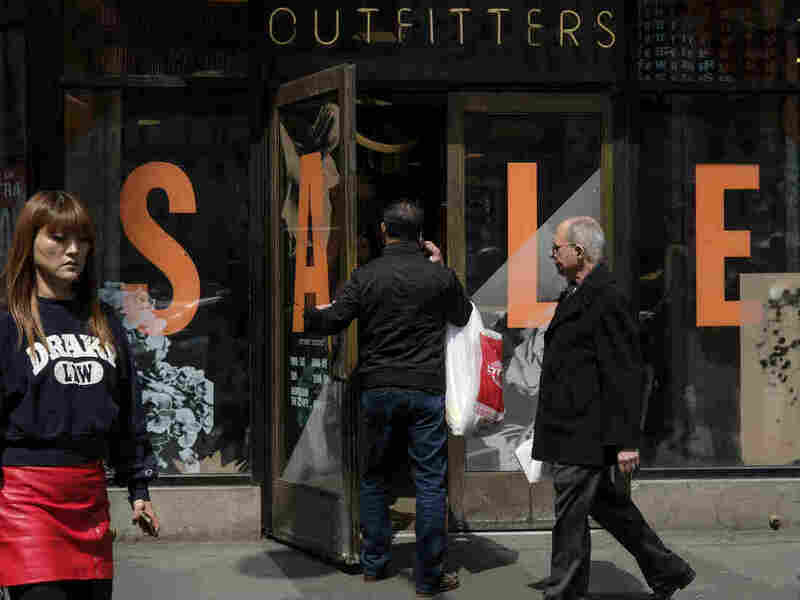 U.S. Economic Growth Slowed To 2.3 Percent : The Two-Way Consumers didn't keep up with the blistering pace of spending, which meant slower economic growth. But recently, growth has tended to pick up momentum later in the year. Analysts expected consumer spending growth to slow in the first quarter, curbing overall economic growth. U.S. economic growth slowed in the first three months of the year to a 2.3 percent annual rate, down from 2.9 percent at the end of last year. One reason is that consumers didn't keep up with the blistering pace of spending at the beginning of the year, which means slower economic growth overall, analysts say. But, if recent trends are any indication, the economy will pick up steam soon. During the last couple of years, growth was slow in the first three months, only to pick up again later in the year. Despite the slowdown, this year's economic growth did come in stronger than what economists had expected. The economy also fared better than the sluggish beginnings to 2016 and 2017. Still, the 2.3-percent showing in January through March falls short of the Trump administration's target growth rate of 3 percent or more. Analysts are predicting the second quarter economic growth could be in that 3 percent range. The first quarter growth rate issued by the Bureau of Economic Analysis is a first estimate and will be revised in coming months. One reason for the apparent first-quarter sluggishness has less to do with actual economic activity and more to do with flaws in the government's seasonal adjustments in the winter months, analysts say. But there are some real forces at work, too. Growth in consumer spending, which accounts for about 70 percent of U.S. economic activity, slowed to a 1.1 percent rate in the first 3 months of the year, down from the lively 4 percent rate at the end of 2017. That's partly due to a natural slowdown from the holiday high to the winter doldrums. President Trump and his economic team have repeatedly said their policies will produce annual growth of 3 percent or more. It was well below that in Trump's first year in office. But in 2018 it could get close to that. The International Monetary Fund forecasts 2.9 percent growth for the U.S. this year, fueled by the big tax cuts and increased government spending. But, the IMF says, the trade conflict between the U.S. and China could undermine that forecast. Grant Thornton economist Diane Swonk agrees. "Concerns about trade and tariffs are taking a toll on business optimism, offsetting some of the euphoria Congress hoped to achieve with tax cuts," she says. Economists caution that long-term trends in population growth and worker output, or productivity, mean the U.S. economy's potential long-term growth rate is only in the 2 percent range. The Trump administration has said the big tax cuts for business will lead to greater investment that will make workers more productive and boost long-term growth. "So far, we have seen few signs that the tax cuts are stimulating investment," Swonk says. But, she adds, it's too early to assess, since the incentives in the tax bill are aimed more at investment in the medium term and when the first quarter ended, the tax cuts were only three months old.